Ed Miliband has been walking round like a puffed-up pigeon and asking girls if they want to feel his biceps, after David Cameron today ruled out taking him on in a one-on-one. Cameron insists that a televised debate ahead of the General Election can only be meaningful if every single party in Britain has at least seven members present, and preferably with the sound switched off, which has led to accusations that he is running scared from a confrontation. The leader of the UK’s third party, Nigel Farage smashed his glass on the bar, spat out his fag and shouted “I’ll take ’em both on!” but just then a black person walked past, and he had to run and hide in the pub toilets. 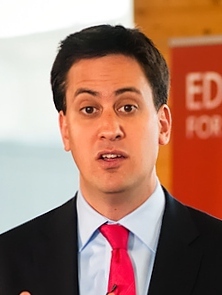 Deputy PM, Nick whatever-his-name-is, tried to say that he would be more than happy to take on Ed Miliband in front of everyone, but unfortunately a small gust of wind blew him away. Posted on March 5, 2015 at 11:09 am in Politics, Satire	| RSS feed You can	trackback	from your own site.